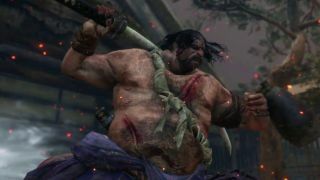 When you head to the Hirata Estate in Sekiro: Shadows Die Twice, it can be quite natural to feel overwhelmed. With a focus on burn damage, this area is formidable and a real test of strength right at the beginning of your adventure. The gauntlet is rough to say the least, but when you make it to the Main Hall (which is very much on fire), you will hit a major stopping block in Juzuo, a slick-haired ogre with a remarkable sword. He’s a drunkard, and as such, his breath spits pure poison, and he’s surrounded by merry friends. Wise men say only fools rush in, and that’s why you should fall in love with being cautious when you’re fighting Juzuo. First off, work your way through the small river (take note of the blue-robed samurai NPC) and on the left, you will find a little house where two of his foot soldiers are waiting. Take these guys out first. This battle is all about isolating Juzuo so you can thrive in combat. Once you’ve done that, follow through the hall past the doorway they were blocking until you get behind the whole crew. Crouch and sneak up to his soldiers and wipe them out one by one. If you can chain a few Deathblows in one run, even better. You will naturally alert everybody, but just run back to the little house you cleared to reset their aggression. Soldiers down, you’re left with Juzuo. Now, head back round to the stealth spot at the back that we told you about and hit the big man with a Deathblow. This will cut his health in half, meaning you only have to relinquish one posture or health bar to beat him. Ok, so he’ll be following you, alerted now. Ignore him and talk to the blue samurai. This guy functions like a summon in Dark Souls and will distract Juzuo whilst you bring the pain. Wail on him and be sure to deflect when you get the chance. If you’re still struggling, pause and equip some oil in a quick item slot (you should have picked some up from the soldiers in Hirata Estate) press up to chuck one at Juzuo and cover him in oil. Then, use the Flame Vent to burn and stagger him, opening Juzuo up for massive slashing damage. The only other thing you should know to avoid is his poison attacks. If you see him drink, coat his sword, or gear up to open his mouth, run like hell! Besides that, you should be good to go. He sure is imposing, but if you follow our tricks, he’ll be dead in no time.